From the producers of Orphan Black and the creator of Lost Girl comes Killjoys. This sci-fi adventure follows a fun-loving, hard-living trio of interplanetary bounty hunters (a.k.a. Killjoys) sworn to remain impartial as they chase deadly warrants around the Quad, a system of planets on the brink of revolution. A motley crew that always has each other's backs, until a dark secret threatens to tear apart their trio for good. Follow their..
From the producers of Orphan Black. The galaxy’s most badass bounty hunters are back in Killjoys: Season Two. It’s now up to Johnny and Dutch to rescue a kidnapped D’avin. As our trio continues to hunt deadly warrants threatening a bloody, multiplanetary war – they face old enemies, the tyrannical Company and the mysterious agenda of Khylen, Dutch’s former mentor.Special Features Includes A Download Of This Season To Watch On Your Mob..
Own Killjoys Season 2 DVD from Deff, DVD, Blu-Ray & 4K Video Specialists - Free UK Delivery..
Own Killjoys Seasons 1 to 3 Blu-Ray from Deff, DVD, Blu-Ray & 4K Video Specialists - Free UK Delivery..
Own Killjoys Season 3 DVD from Deff, DVD, Blu-Ray & 4K Video Specialists - Free UK Delivery.. Scattered to the far corners of the J galaxy and beyond, our Killjoys find themselves united by the knowledge of the name of their true enemy: The Lady. An immeasurable manifestation of evil without beginning or end, The Lady is making her play and our trio has something she wants - the Hullen Heir. 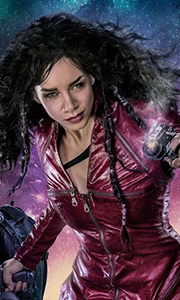 While Dutch is on a journey to face her biggest foe yet, D'av and John are trapped in an elevator in deep space with a pregnant Delle Seyah..
Own Killjoys Seasons 1 to 3 DVD from Deff, DVD, Blu-Ray & 4K Video Specialists - Free UK Delivery..